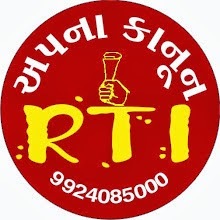 The Mahiti Adhikar Gujarat Pahel (MAGP), the state’s premier Right to Information (RTI) campaign body, has expressed dismay over the fact that during the last eight years, as many as 27 RTI whistle blowers were hacked to death all over India, out of which four were from Gujarat. Those who were killed in Gujarat after fighting for their rights under RTI were -- Vishram Dodiya,Amit Jethva, Jabardan Gadhvi, Nadeem Saiyyad. Suggesting that this is a “poor record” for a state which calls itself progressive, a presentation on the eighth anniversary of the RTI Act said, in the country as a whole over 155 whistle blowers were “brutally attacked” in India but survived, of which 24 such attacks took place in Gujarat. Talking with newspersons in Ahmedabad on the occasion of the eighth anniversary of the Act, which they said has “helped marginalized sections of India bring in major changes in their life by seeking information from government sources on disbursement under different schemes promulgated from time to time for their benefit”, MAGP campaigners, Harinesh Pandya and Pankti Jog, also regretted that the Gujarat Information Commission has lately begun to show lack of transparency. Significantly, this was done at a time when the Commonweath Human Rights Initiative, in its new report, "The Use of Information Laws in India", has taken strong exception to the fact that the Gujarat Information Commission is one of the few states which have been refusing to upload their annual reports on their website. Other major states have not done it ever since 2006, when the Act became operational in all the states, are Uttar Pradesh, Madhya Pradesh and Tamil Nadu. Killed by under the members scanner. Filed a petition on funding of the village draining system. Jerua village in Latehar district of Jharkhand. Sought information on the nexus among officers, politicians, contractors and middlemen in NREGA related irrigation projects in Deori.